New version Avira Free Antivirus 2018 direct download link offline installer. The installer is for 32-bit and 64-bit Windows. Besides released Avira Free Antivirus, Avira also release the lineup 2018 products. Download the Avira Free Antivirus 2018 offline installer is recommended for users who have slow internet connection. Avira Free Antivirus 2018 come with many improved & new features. The application is powerful to clean & block viruses, ransomware, and other computer threats. Other features on the application such as internet protection (browser toolbar), tracking blocker, social networking protection, and website safety advisor. Avira Free Antivirus is one of the best free PC security solution on the internet. There are two version installer of Avira Free Antivirus 2018; online & offline installer. All version is works on Windows 32-bit & 64-bit. To download, use the following link. Direct link offline installer Avira Free Antivirus 2018: : avira_antivirus_en-us.exe. Download online installer from official page: Visit this link!. Offline installer is good for users with slow or no internet connection. If your internet connections is very fast, use online installer because it also with latest patch & update include. The Avira Free Antivirus offline installer 2018 version size is ~226 MB. 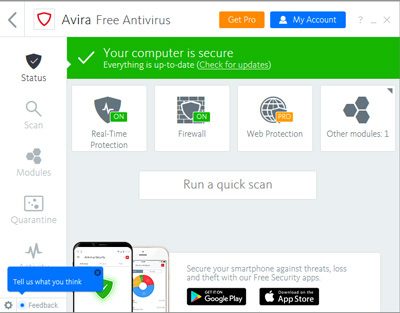 Avira Free AntiVirus 2018 features with standard protections only. New version Avira Free Antivirus 2018 only works on Windows 7 SP1 or above. It mean work on Win 7 SP1, Win8/8.1, and Windows 10.